I love taking short vacations at different hotels as they give me the freedom to explore more. I’m continuously searching for activities for each region I visit. For this selection, I cherry-picked the Fairmont Chateau Montebello: it’s the largest log structure in the world. During the 1920’s, a group of 3500 special craftmanship starts the construction of the Chateau Montebello. 4 months later the project was completed and became an important part of Quebec History. The unveiling happened on July 1st, 1930; 88 years and 1 day later on July 2nd, I’m spending time at this unbelievable resort for my first staycation. Once understanding the chronicle of the hotel, it made my visit a lot more memorable. You can sense the history while walking the passageways. Although observing the fireplace and seating area from the rotunda: I can visualize all the transactions that various guests shook hands on as an associate of the Seigniory Club to the present-day. Set for the open-air? The Chateau Montebello has preserved the resort atmosphere; accessible options for activities, the indoor, outdoor pools, kayak to pontoon rentals, a boating dock, booking your time at the spa to many magnificent dining opportunities. The one dining experience that captivated me happened to be the outdoor BBQ area. We open the windows in our room in the early daybreak to eavesdrop as the birds sang, the aroma of their smoker was to die for, as it crept up in the room making us hungry for some of their gastronomic capability (we chose to eat dinner indoor due to the weather circumstance). A 5km cross-country trail is a great way to see the landscape where the Chateau Montebello lays. You can explore it during any of the 4 seasons. It will allow you a view of the Ottawa River, the wildlife that surrounds the resort and Papineau Mansion. A big part of Quebec history, The Papineau Mansion was built between 1848 and 1850 as a wilderness retreat for a social club. Now a National Historic site (managed by Parks Canada). The Papineau Mansion is a beautiful asset to the Montebello area. If you’re discovering the region of Montebello for the first time? The historical site can be accessed via Chateau Montebello or from Rue Notre Dame at the Old Train Station. A stop at the Tourisme Outaouais visitors office for more ideas with what to do and see while in the Montebello region. You can explore the site of the Papineau Mansion on your own or complementary tour either in French or English tour supplied daily (tour fees are under $8.00 per person) plenty of information on this historical site. A long day of exploring? We asked the locals we met today, what is your favourite eatery? Le Bistro is a unanimous choice by everyone, located past the Old Train Station at 521 Rue Notre Dame. Prepared is a table for two and our culinary experience begins. We made our selections for our appetizer, drinks to start the evening. The decorations at Le Bistro gives it a great atmosphere that is composed of a large decorative menu. Le Bistro is a great restaurant filled with delicious, flavourful and well-presented plates. Everything we ate was delicious, flavourful and well presented. The young lady’s service is the star of the night, adding we had a problem with our main plate that delayed our evening. Now I know you’re going to think, again… But yes, a stop at my much-loved activity: Parc Omega, a 15 km long conservation park introducing many of our Canadian wildlife. I frequently stop at the park, it provides me access to oodles of wildlife I would certainly wouldn’t see as lots are situated in the Arctic, like the arctic fox and Arctic wolf. Some prairie wildlife adding lots of deers, wolfs, wapitis and an area with local farm animals and a deer petting area. It will take you a few hours to go around, and experience everything while in the spring taste the maple syrup at the Sugar shack. 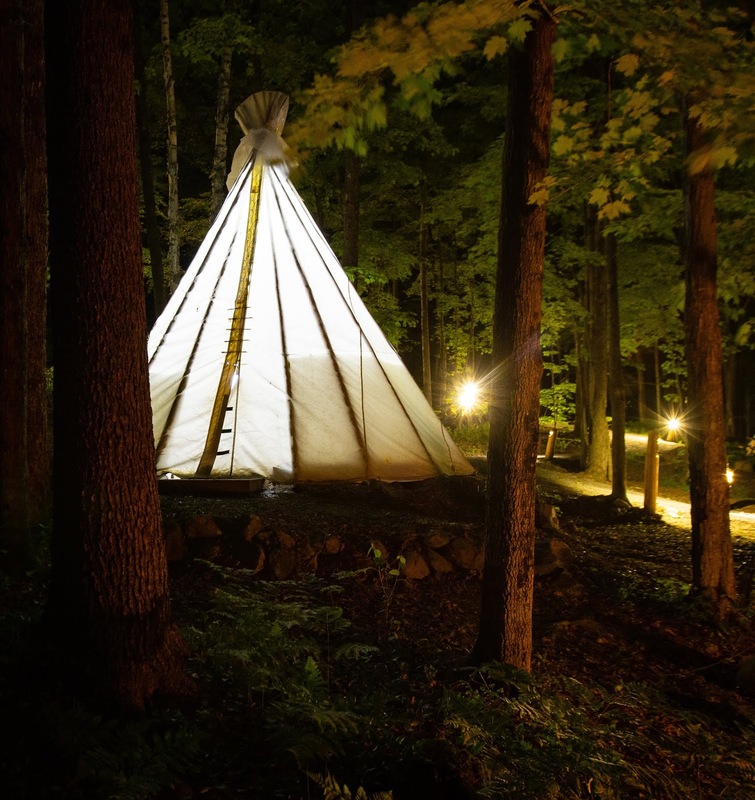 Spending a night in their accommodations that features log cabins, an aboriginal experience with a stay in a tipi and a mix of tipi and cabin. All have fire pits when weather permitting, 2 double beds or more, bedding and wood for the campfire. There’s also access to towels, washrooms and shower access for your convenience. I’ve done both winter and summer experiences and it was a fun family activity, providing you with a boardwalk that leads you to a reserved bear and timber wolf observation area.